You want to climb a seriously steep mountain to some unique and awesome Hudson Valley views. Background you can feel free to skip: If I were Lambs Hill, I’d be pretty upset about everyone calling me a hill. This place sure feels a lot like a mountain. Our old hiking group used to climb nearby Beacon Mountain every summer, but we never found a good route to the top that didn’t involve bushwhacking our way through some deer trails (this was before the awesome trail improvements on Mt. Beacon). Eventually, that got old. I’d been hoping to find a go-to hike in these hills, since they’re so close to home, but hadn’t found one until I stumbled across the Scenic Hudson Fishkill Ridge page. Magnificent views? True wilderness? Rugged terrain? Sounded worth a visit. Shortly thereafter, as I labored up the steep Overlook Trail towards the summit of Lambs Hill, soaked in sweat, a family of four came strolling downhill with two small children. “Excellent,” I said, then turned to watch them leave, realizing that they didn’t have an ounce of gear on them, not even a water bottle. How’d they do that? A few minutes later, a huge group of twenty-something hikers came down the hill, none of them carrying even a backpack. How were they climbing this trail with zero supplies? “Are you guys with a hiking club?” I asked the last person in the group. “We’re with Luke’s,” I thought he said, and I nodded as if I understood. Turns out, they were all coming down from Malouf’s Mountain Campground, a full-service private campground with pretty cool-looking facilities off a spur trail from the Overlook Trail. If you’d like to make your stay at Fishkill Ridge an overnight extravaganza, this looks like a fun way to do it. Assuming you’re just hiking the old-fashioned way, though, bring plenty of water and snacks for this one. The hike up the Overlook Trail to the summit of Lambs Hill is a strenuous and steep climb, visiting some unique dwarf pine forests and offering several expansive overlooks across Beacon and the Hudson River to the Gunks and Catskills beyond. 1. Like all the awesome Scenic Hudson parks, this one has a great web site with a printable trail map. We’ll be climbing the Overlook Trail from the Fishkill Ridge Trailhead, then banging a left on the White Trail to the summit of Lambs Hill. 2. From the Scenic Hudson parking area, head over to take a gander at the informational kiosk and grab a trail map if you need one (putting the map back at the end of your hike is good karma). To your right, the red-blazed Overlook Trail heads uphill, into the trees. When you’re ready, hop on it to begin your climb. 3. Keep left when an unmarked trail joins you in a moment, then turn right to stay on the Red Trail at a slightly-less-informational kiosk. 4. Ready, set, trudge! Just keep following the plentiful Red Trail markers. The next landmark is the spur trail to Malouf’s Mountain Campground, coming up in about a half-mile, after you climb 350 feet. If you were staying at Malouf’s, you’d turn left here to enjoy the bounty awaiting you. For the rest of us, the hike continues. 5. The trail dips slightly to a seasonal stream crossing in less than ten minutes. After you cross that stream, the trail takes a hard right turn, and the real climb begins. 6. Another half-mile and 350-foot vertical climb brings you to an open rock formation that gives you your first taste of a view today, looking out across the city of Beacon. 7. If you’re here at the right time of year, you might see some blueberries about. Keep your eyes peeled! 8. From the first view, it’s about .6 miles and 300 vertical feet to a nice money spot amidst some dwarf pitch pines, which I didn’t know existed in the Hudson Valley outside of the Mohonk Preserve. You’ll pass some other views of Beacon along the way, but you’ll know you’re at the money spot when you see the towers atop Mount Beacon straight ahead, with nice (but partially obstructed) views to your right of the Newburgh-Beacon Bridge and Catskills beyond. At this spot, you’re just a few yards from the junction with the White Trail. Take a few moments to catch your breath and check out the pine cones. 9. When you’re ready to keep on chugging, follow the Red Trail through some scratchy pitch pines to its terminus, just a few yards behind the viewpoint you were just enjoying. Here, you’ll have to choose whether to turn right or left on the White Trail. Choose left. 10. From here, it’s a rolling .4 miles to the top of Lambs Hill. Follow the White Trail markers as they lead you to your destination. 11. Just before the short climb to the top of Lambs Hill, the trail parallels an old stone wall, then climbs steeply for a few feet. All of a sudden, the terrain opens up in front of you, and you get the feeling that all this climbing might be about to pay off. That feeling is correct. 12. Just a few more feet and you’re there. The summit of Lambs Hill graciously offers plenty of nice rocks to sit upon while you take in the view. At this moment, your legs would probably vote to call this place Lambs Mountain. And so would your eyes. Enjoy the long westward view across the Hudson Valley. It’s been a long day to get this far — don’t begrudge your hiking partner a nap. 13. When you’re done soaking it all in, retrace your (copious) steps back to your car. Follow the White Trail to the junction with the Red Trail (being careful not to stroll past this junction, which is marked with some arrows on the rocks), turn right, and hoof it on the Red Trail all the way back. The descent took me 75 minutes with a toddler on my back. 14. If you see any Scenic Hudson people, give them a high-five and thank them for another awesome hike. Directions to the trailhead: From either the Taconic Parkway or Route 9 headed south from Poughkeepsie, hop on I-84 and head west. Take exit 12 for NY 52 East, then turn left onto 52 (Main St.). After .3 miles, turn left onto Old Glenham Road. In about a mile, turn left onto Maple St. Maple St. splits in .1 miles, and you’ll veer right onto what is now called Washington Ave. Once on Washington Ave, take your first left onto Old Town Road. In .4 miles, turn right onto Sunnyside Road, which takes you through a nice little neighborhood. There can’t possibly be a hike starting in this neighborhood, can there? Your answer lies .4 miles ahead, on the left, where you’ll see the giant Scenic Hudson sign marking the gated Fishkill Ridge parking area. Turn left, park in the spacious lot and let the adventure begin. You can also get directions by checking out the Fishkill Ridge: Lambs Hill entry on the HiketheHudsonValley.com Google map. Sorta nearby address for your GPS: The intersection of Old Town Road and Sunnyside Road in Beacon, NY is just .4 miles from the parking area. Turn right onto Sunnyside Road and you’ll be there in a moment. My old-ish Garmin Nuvi lets me put in an intersection as a destination, so hopefully yours does, too. Did this hike today. It’s worth continuing past Lamb’s Hill to get some awesome views back to the east towards Route 9. There’s a great little area with a makeshift rocking chair where you can hang out for a while, and if you look off to your left you even get some views back toward the Hudson. Once you get to Bald Mountain there is an unmarked trail that will take you back to the parking area, going past a really neat memorial to Navy pilots who died in a 1945 crash on the mountain. It’s a cool way to complete the loop and keeps you from having to retrace your steps. I’d also recommend going west just slightly on the white trail when it meets the red. Gives you some cool views back on Mt. Beacon if you walk a few hundred feet. FYI, the Scenic Hudson Fishkill Ridge Trail Map is no longer accurate. The Scenic Hudson Mount Beacon Trail Map seems to be an updated version and shows the correct trail markings in the vicinity of Dozer Junction (white, yellow, & blue trail intersections). I reported this problem to Scenic Hudson. Both hike loops are awesome. Great hike! Took my three children up today, though we turned around just before the white trail, so was less than 4 miles for us. All the downed trees before Malouf’s are cleared and only one tricky one to cross after that. Thanks for the excellent info, Mike! Thanks so much for the kind words and the helpful update, Steve! Your kids are troopers to make it that far up the trail! (And you’re a trooper for bringing them.) Glad you all had a great day out there! Be advised that as of May 2018, there are several downed trees in the lower section of the trail, including some that are challenging to cross. Great hike and very accurately decribed. There were snow patches, not much mud and beautiful icicles on the rocks just below the summit. Very few hikers – what a great contrast from beacon fire tower hike. Definitely recommend. Thanks for pulling all this information together – it makes trying new hikes a breeze. Thanks so much for the kind words, Elizabeth! Glad you’re finding some good new adventures out there. Lovely hike today. The trail was a bit muddy in places, a small stream in others, and snowy in just a small patch near the top of Lamb’s Hill. I live In the town of LaGrange,NY and see red lights flashing in the mountains. Are they yours,or can you tell what they are. I see them from my living room every night,and really don’t like them. It really takes away from the peacefulness of the evening. Hi, Katherine! Are you referring to the lights atop the communications towers on Mt. Beacon? Those towers do not belong to me — I’m afraid my media empire only extends as far as this website. (Maybe someday, though!) If I’ve misunderstood, please let me know. Otherwise, I hope you can continue enjoying the view of Mt. Beacon from your living room, even with the red lights – sounds nice! Has anybody taken public transit here? I’ve done the Mt. Beacon trail and that was an ok walk from the train to the trail, but this looks like over 4 miles and adding an extra 8 miles round trip to the hike seems like a bit much. I know there’s buses that run in the area, but from what I can tell the closest one still leaves me over 3 miles from the trail. Does anybody know if there is a way to go from train to trail using public transit? Or would Taxi be my best bet, if so, how much did it cost you? It’s very easy to do this by public transit–just in reverse! Take metronorth to Beacon and start at the beginning of the red Casino Trail, just as if you were climbing to the fire tower. In about 5-10 minutes you should see the yellow trail to your left–this is at the extreme left end of the first switchback uphill. 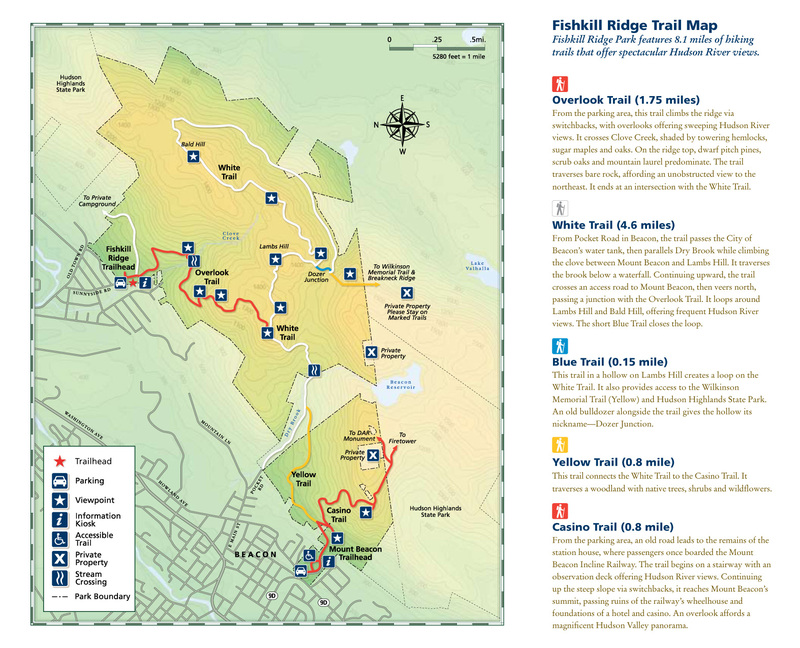 The yellow trail leads to the stream, the waterfalls, and the white fishkill ridge trail, which leads to the red overlook trail. If you want to make it a loop, you could hike almost to the end of the overlook trail, then take a woods road up to the top of Bald Hill (it’s marked as a red dotted line on the online map) where you can take the Fishkill ridge trail back to Dozer Junction, Lamb’s Hill, and the beginning of the hike! I’m just seeing this response a month later, but thanks a lot Christopher! I’ll probably do this! Just did this hike this morning. Ran as much as I could… up and down in 1hr 20 mins. Thanks for the helpful directions, and this terrific website. Anyone know if there are timber rattlesnakes on this hike, too? I want to take my dog but won’t if there’s a chance he would come across one. Thanks! Affirmative. Timber rattlers, black rat snakes, northern ringnecks. They are all out there on Fishkill Ridge and it appears their presence is increasingly prominent over the last 3-4 years. If you are really put off by their presence, you might want to wait until mid-November when they retreat to their dens and their inactive state through March. Thanks. Yea, I’m only put off because I love taking the dog hiking and he loves it, too. And I’m not going to risk an encounter where he either unknowingly comes across one or sees a snake and provokes it. Just hiked Lams hill today alone since the LADY didn’t want to get up at 7am with me on a saturday… Her loss! This was a good hike, I ended up finishing it in around 2.75 – 3 hours with a 20 minute break at the top to take in the scenery. The trail is well marked, however all the leaves on the ground made it a bit harder to follow at points. If you go anytime soon, the hardest part to follow is the step where you’re going to cross the small stream. The trail is pretty much hidden by the leaves and the red markers don’t really let you know that you need to follow around to the left, which will lead you down to a small crossing to get to the other side. Outside of that, the terrain is a bit rocky and steep, definitely worth grabbing one of the walking sticks lined up in the parking lot!! Thanks again for the write up! Your site has been keeping me busy!! Another great hike, thank you! Perfect directions and very well marked trail. Great views on the way up and the top of Lambs Hill is just such a great peaceful stop. Tough to leave on a day like today. Thanks again! I was wondering if anyone knew how to get to this flagpole. It is in the vicinity of Lambs Hill and the Wilkinson Memorial Trail. I spent yesterday (August 2, 2015) searching for it, but came up empty. If someone knows how to get to this spot, I would appreciate any info. Hi Carlos! I did wander onto this site by accident years ago, starting at a different trailhead than the one outlined above. I wouldn’t be able to trace the route I took that day, though – it was more of a “get lost and see if I can make it back” kind of adventure, before this web site was even a twinkle in my iPhone. I was reading another hiking blog (who knew there were OTHER hiking blogs?!) and saw someone mention an American flag on a makeshift pole just off the Wilkinson trail on Lamb’s Hill. A reader added this comment to clarify where it came from. “Many hikers across the Fishkill Mountain range that includes Mt. Beacon and nearby peaks, are treated to a rare sight…. an American Flag flying on a makeshift pole high above the trees. Many have speculated or wondered what the origin of this monument might be. Let me solve the mystery for you. Somewhere around Memorial Day of 1988, the City of Beacon fathers were considering canceling the Memorial Day parade due to ‘insurance’ concerns. This was unacceptable to members of the Darcy family who had served in the military and felt strongly about the continued recognition of American Veterans. Bob, Dean, Pete and Pete’s son Matt decided to camp-out on the mountain and erect a Flag in memory of those who had given their all. What was originally intended to be a solitary tribute has become a permanent gesture. Every year and sometimes twice a year depending on condition, this flag is replaced by John Darcy or a friend of the Darcy family. Many in the family and extended family, have taken on the responsibility of helping John to insure that a flag flies on what they knew in 1988 as, Lamb’s Hill. The tribute holds another special meaning to the Darcy family. At Bob’s passing, his request to have his cremated remains placed near the flag was honored. Dean, Pete, Matt, John and Bob’s wife Judy, along with other family members and friends again climbed Lambs Hill in August of 1994. Bob continues to enjoy the serenity of this awesome location atop Fishkill Mountain and the Darcy family continues its tradition. Dean, Pete and Matt all reside in Georgia with their families but a hike ‘up-the-mountain’ is always part of their visits back to Beacon. If you happen upon the flag during a hike, stop, enjoy the view and say a prayer for those who can’t. If you find the flag a little worn or tattered, contact any Darcy and it will be replaced. For those who have not had the experience of viewing the flag, it is featured on Google Earth as a landmark on the mountain. Ref: ‘Flag on Fishkill Mountain’. Do you know if there’s a USGS marker anywhere on Lambs Hill? I poked around up there, but didn’t see one. Thanks again for the excellent write-ups. I appreciate your honesty regarding hike difficulty and length. So many other sites make some of these hikes sound like a relative walk in the park. Hey Jeff — You know, I sure don’t know. I didn’t notice one when I was up there, either, but I wasn’t really looking. And thank you! Yeah, it seems like a lot of hiking guides are written for people who think a 10-mile hike is just getting started. By the time those folks are on about mile 7, I’m already on my third slice of post-hike pizza.